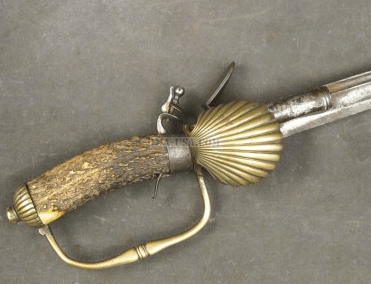 A VERY GOOD AMERICAN REVOLUTIONARY WAR PERIOD FRENCH MODEL 1767 GRENADIER HANGER, ca. 1770: In overall very good+/near fine condition with smooth gunmetal gray-brown surfaces with light patches of discoloration and some wear. Regulation design, Model 1767 Hanger-type, single edge, 26″ unmarked steel blade with its original cutting edge with some very minor nicks/imperfections. 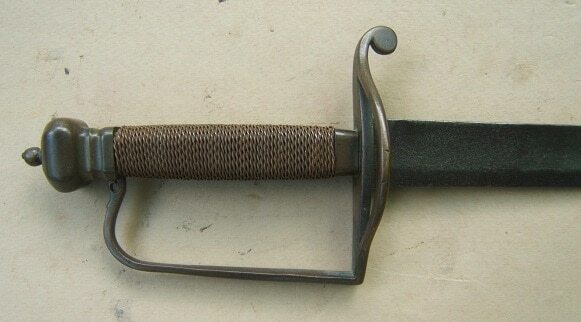 Embossed and cast brass hilt of regulation form with a straight quillon, a ribbed/roped grip and an integral stirrup-type knuckle-guard. In overall very good+/fine untouched condition with a fine, mustard toned, dark patina. Very good blade with smooth dark smooth surfaces and some light patches discoloration. A very nice example of a Revolutionary War French Model 1767 Hanger, ca. 1770. For a similar example, please see George C. Neumann’s: “Swords & Blades of the American Revolution”, pg. 314. Overall length, 31 1/2″.